The Valley of the Sun is ringed by ranges of mountains, chiefly volcanic in origin. But some 30 minutes due north of Old Town Scottsdale the real bedrock of the valley is exposed, where gorgeous golden granite has eroded into striking forms. 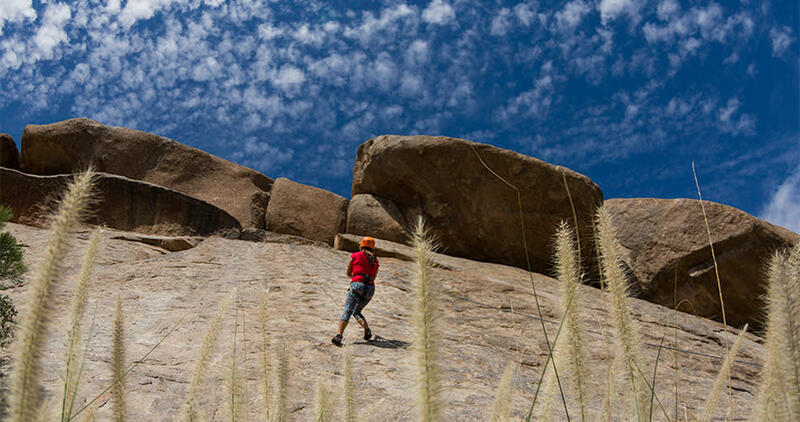 These rounded shapes and sheer walls have long drawn local climbers to hone their skills and teased newbies into learning the ropes of climbing at the Boulders Resort and Spa, aptly named for its surroundings. Since I am one of those newbies, I booked a climbing lesson at the Boulders Resort with instructor Rico Riley and geared up with some fellow visitors to learn the ways of the rock. After a detailed safety chat, we donned climbing harnesses, helmets, and thin-soled sticky shoes that give me visions of Spiderman. Before I can get too carried away, we spend considerable time on the practice boulder – a smallish rock face on which to get comfortable and overcome any jitters. After all, we all remember the law of gravity, and would rather not test it on this fine morning. Eventually, our small group of five novice climbers is comfortable and ready for the main wall. Rico cruises up the 75 degree wall like he’s dancing with the stars, affixing ropes to various permanent bolts along the way. One by one, we scale the wall and learn to rappel down, using those sticky shoes to best advantage. Rico says the hardest thing about rappelling down the face is getting folks to let go with their hands and trust the ropes. For me it’s more about trusting the instructor, and I truly do – Rico is a highly experienced and relaxed teacher who has an eye for spotting confidence, or lack thereof, in his students. We use every bit of the 2.5 hours available, grinning and cheering each other on as our skills grow in real time. This is pure fun, with just a bit of adrenaline, and the morning sun paints the rock yellow under that azure Arizona sky. No wonder so many groups come here for genuine team building. Solo climbers and non-resort guests also are welcomed. 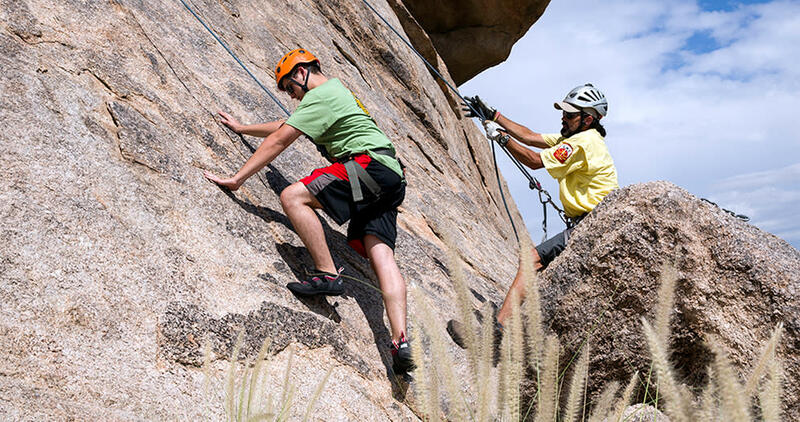 Click here to learn more about rock climbing (as well as lots of other outdoor adventures) offered at the Boulders Resort. $135 + 20% gratuity includes all rock climbing gear and lessons with the guides. In September the lessons are mid-afternoon, but from October to April lessons are anytime you wish. Climbing is not offered during June, July or August. Rock On!